This site is replacing CanadianMarathoning.bc.ca, but will be offering the same great content plus some cool new features. Check out the About Us link for more information. This Popup will appear only to users who have been re-directed from the old site, so please update your bookmarks. Tristan Woodfine of Cobden, Ont. was the top Canadian at this morning’s Chevron Houston Marathon, finishing in 13th position with a time of 2:15:19, a three-and-a-half-minute personal best. Am I missing a marathon distance event in your area? Lovig and Watson top Canadians at London!! Gwen McFarlan and Ed Whitlock still ranking in 70-79 despite being over 80!! Wieczorek and NIcholson take titles at the Bluenose Marathon!! 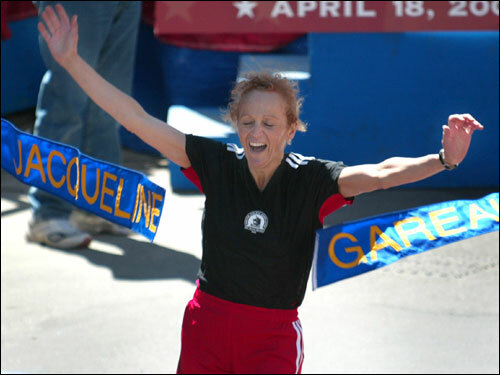 Canadian Jacqueline Gareau crossed the finish line (at the 2005 event), breaking the ceremonial tape to honor her 1980 Boston Marathon win. Gareau was denied her chance to break the tape in 1980 because of the infamous Rosie Ruiz incident. Ruiz had snuck into the race and finished ahead of Gareau, but it wasn't until well after Gareau had finished the race that Ruiz was recognized as a fraud. In his first full season as a marathoner, Jerome Drayton (born 1945) surprised the running world with his win in 1969 at the Fukuoka world championship race in Japan. He won it two more times and also won a Boston marathon during his athletic career. This photo, taken at the end of the runner’s sixth-place finish at the 1976 Montreal Olympics, shows the physical exhaustion resulting from his efforts exerted during the 42.2 kilometre run.